Graphics inspired by landscapes and other motifs taken from the natural world are one of the most popular motifs in our catalogue. It is also probably the most popular subject matter of all works of art since the dawn of time. Even our most distant ancestors considered it worthy of immortalizing in art... Nowadays, although we don't live as close to nature as primitive people, we still have a great fondness for it: so if you feel an irresistible desire to decorate a wall in your home (or any other surface) with a motif taken from the world of nature, a nature wall sticker is a great solution. Read our guide and find out how decorative nature wall stickers can add variety and beauty to your home – in more than one way. Nature has been a great source of inspiration for artists from around the world since time immemorial. From painted landscapes through wonderful descriptions of nature in poetry and prose to music inspired by the sounds of birds or trees, the world of nature never ceases to amaze, delight and provide ideas for new and wonderful works of art. Every one of our nature stickers is also inspired by the rich and fascinating world of nature. As soon as you take a closer look at the designs we have prepared, you will notice that we have selected extremely diverse options. This includes stickers with seascapes, but also landscapes with dense and dark forests. There are designs inspired by animals and nature wall stickers featuring flowers or leaves. We are confident that everyone will find something suitable here – regardless of personal preferences, the way you're planning to use your sticker, or even the style of your interior. After all, is there an interior that would not benefit from a decoration inspired by the wonderful world of nature? There are many reasons why wall stickers are quickly becoming one of the most popular ways to add interest to an interior. What's very important is that they represent a wide variety of beautiful designs – our nature stickers are a proof of that – but what's also important is that they are very easy to install and maintain. What's more, they can be removed from the wall without damaging the surface, which will be appreciated by all those who live in rented apartments and those who like to change the decor of their surroundings every season. It is not only the stunning variety of designs that makes the decorative nature wall stickers a universal ornament: the manufacturing process is also important. High-quality, durable materials and the modern technology of super-durable latex printing make each of our stickers resistant to such factors as increased temperature, humidity or even direct sunlight. Thanks to this, they can be used to decorate any interior, from the living room and bedroom through the kitchen to the bathroom. Up until now we have been talking mainly about wall stickers: and while decorative wall stickers nature are undoubtedly a fantastic option, they are by no means the only one! On the contrary: stickers can be used in a number of interesting ways. Below are some of our favorite proposals. Freshening up or personalizing furniture: a great option, whether you want to add a bit of individuality to furniture you bought from the supermarket or give your flee market finds a new look. Carefully selected stickers with nature designs applied to the door, tabletop, side or any other part of a piece of furniture, will give it a truly unique character and freshen up its appearance. It is also a great way to personalize and match the look of your equipment to the style of your interior: a flower sticker applied to the table top or the front of a chest of drawers will make it fit in better with an eclectic or vintage interior design, for example. Adding interest to the fridge and other household appliances: the fridge is usually the largest of kitchen appliances and has a huge influence on the appearance of the kitchen – and yet it is usually neither particularly pretty, nor particularly interesting. Stickers with designs inspired by nature can help you change it: with them, you can easily turn a fridge or other kitchen appliance into a real decorative gem. Decorating doors, windows and partitions: nature stickers are always a good option, but a large sticker doesn't only work on walls. You can also use it to decorate doors, partitions, partition walls and many more surfaces! Natural designs wouldn't have the same appeal if they were not made with the protection of the natural environment in mind. We have already mentioned materials and technologies, but we have not yet said that we select them because they are also environmentally friendly. 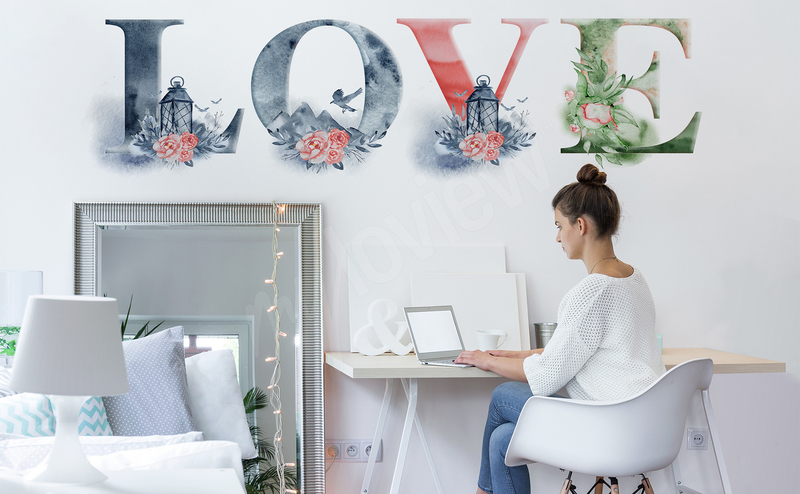 In particular, the latex printing technology allows us to significantly reduce the amount of toxic substances released into the environment during the production of the decoration – and, what's more, it makes our nature wall stickers completely odorless and means they do not release harmful fumes at any point.